FOUND ANSWER FOR YOUR QUESTIONS ALREADY? Let's start applying for Visa on Arrival now! Visa on arrival is an alternative way to obtain a visa for Vietnam in addition to the traditional way of getting a visa at Vietnam Embassy. With this kind of visa, you – the visa applicant is required to submit an online application for a visa approval letter which functions as an official permission allowing you to board the flight and have visa stamped at the arrival airport in Vietnam. To get visa stamped, you need to submit your Vietnam approval letter together with your passport (at least 6 months validity), two passport-sized photos, Vietnamese visa application form and stamping fee to Immigration Officers at the airport. There is a basic difference between visa on arrival and visa at Vietnam embassies. With visa on arrival, the Vietnam Immigration Department will issue a visa approval letter with your name on it stating that you are allowed to enter Vietnam on a specified date. Then, you will have the visa stamped onto your passport at the arrival airport in Vietnam. But for visa applied at the Vietnam embassies, the visa stamp will be on your passport when they send it back to you. 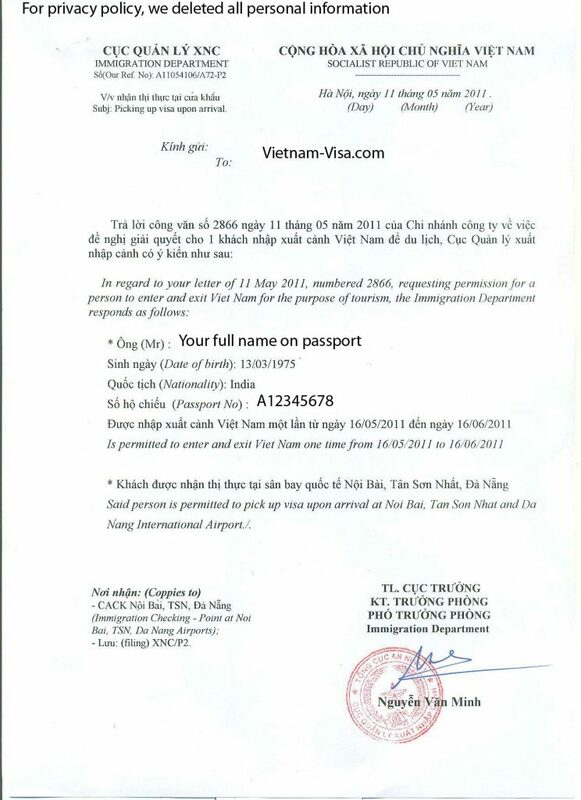 Vietnam Visa approval letter” is a document issued by Vietnam Immigration Department (Vietnam Ministry of Public Security). It functions as an official permission allowing its owner(s) to board the flight to Vietnam and get visa stamped onto the passport upon arrival at Vietnam airport. To get this approval letter, the visa applicant is required to submit an application online to a travel agency which will then work with the Vietnam Immigration Department to return the visa approval letter via email. Please be also informed that the visa approval letter may contain names of some others whose visa requests are processed at the same time as yours. Can diplomatic passport holders apply for Vietnam Visa On Arrival? We’re sorry to confirm that Vietnam Visa On Arrival don’t support this type of passport. What information do I need to provide to apply for my Vietnam visa approval letter? To complete the online application for a Vietnam visa approval letter, the visa applicants need to provide the following information exactly as shown in their passports (as once issued, the approval letter could not be amended in any way). For further information, please see full Vietnam visa application form. Can I use Vietnam visa on arrival for my entry by land or sea? No, you cannot. Vietnam visa on arrival is applicable to air travel only since the visa applicants must get visa stamped at the arrival airport in Vietnam. If this is the case, you are recommended to contact the most convenient Vietnam Embassy/Consulate to apply for a visa. What if I forget to bring photos or print out Arrival Letter when arriving Vietnam Airport? Along with Vietnam Visa Application Form, Photos & Arrival Letter are compulsory documents to get proper Vietnam Visa when being in Vietnam Airport. Therefore; if you forget to bring photos or Arrival Letter before arriving Vietnam Airport, you may have to pay extra money (around 2 – 5 USD) for being taken photos by Immigration Officers & a lot of money to print out Arrival Letter right there. We recommend you use Fast Track Service to make sure that you always can receive immediate & effective support from us through Hotline +84. 946.583.583 when you face unexpected difficulty when entering Vietnam Airport. Be kindly informed that there will be no problem if you change your arrival airport. Since the visa approval letter works at 05 international airports of Vietnam (Noi Bai in Hanoi, Cat Bi in Hai Phong, Da nang in Da Nang, Cam Ranh in Khanh Hoa and Tan Son Nhat in Ho Chi Minh City), you still get the visa stamped onto your passport at any of these three airport regardless of which you put in your visa application. Can I enter Vietnam earlier than my granted arrival date in the visa approval letter? No, you cannot. A later entry is allowed but an earlier entry is not. In case you change your plan and want to enter Vietnam earlier than the granted arrival date, you are recommended to apply for a new visa approval letter. What is difference between a single entry visa and a multiple entry visa? Single entry visa: You are permitted to enter Vietnam ONCE during your visa validity. After you exit Vietnam, your visa will automatically become invalid. If you would like to re-enter you need to apply for multiple entry visa. Multiple entry visa: You can enter and exit Vietnam many times as you want during your visa validity. Can I exit Vietnam later than the exit date granted in my visa approval letter? No, you cannot. An earlier exit is allowed but a later exit is not. In case you wish to stay longer than your visa expiry date, you are recommended to apply for a visa extension. In order to assist you at the best, Vietnam-visa.com also provides Vietnam visa extension service. For more information, please access to https://www.vietnam-visa.com/extra-services/. What is the total cost for a Vietnam visa on arrival? Service fee: is the fee you pay directly to Vietnam-visa.com for handling all procedures with the Vietnam Immigration Department to return the visa approval letter to your registered email. This fee varies depending on the number of applicants in your visa application as well as which kind of service you wish to use (normal, urgent or super-urgent processing). Please see our Vietnam Visa Fees page for detailed prices for each type of visa. 135 USD for multiple entry visa valid for up to 1 year. Can I pay for stamping fee in VND to get Vietnam visa stamped on arrival? Yes, you can. You can pay for stamping fee in VND or AUD, SGD, etc. but USD is highly recommended to avoid any unbalanced exchange rate at the airport. Citizens of Cambodia, Thailand, Malaysia, Singapore, Indonesia and Laos for visits of 30 days at the maximum. Citizens of Philippines for visits of 21 days at the maximum. Citizens of Japan, South Korea, Sweden, Norway, Denmark, Russia and Finland for visits of 15 days at the maximum. Citizens of Brunei, Myanmar for visits of 14 days at the maximum. Citizens of France holding valid diplomatic or official passports for visits of 90 days at the maximum or several visits of 6 months at the maximum. Citizens of Chile holding valid diplomatic or official passports for visits of 90 days at the maximum. APEC Business Travel Card (ABTC) Holders from Asia-Pacific Economic Cooperation (APEC) member economies for visits of 60 days at the maximum. Citizens of UK, Italy, Germany, Spain and France for visits of 15 days at maximum until June 30, 2018. Citizens of Belarus for visits of 15 days at maximum until June 30, 2020. For those who travel to Phu Quoc Island – Vietnam : Foreigners and Vietnamese nationals bearing foreign passports who enter Vietnam through an international border gate and then travel to Phu Quoc Island and stay in Phu Quoc less than 30 days will also be granted Vietnam visa exemption. Passports must be valid for at least 45 days. After arriving in Phu Quoc Island, if visitors want to travel to other localities or stay in the island for more than 30 days, the immigration department will be responsible for issuing visas right on the spot. The photograph must be passport-sized, identical, taken within the past 6 months. The image size from the bottom of the chin to the top of the head should be between 1 inch and 13/8 inches. The photograph may be in color or black and white. They must be full face, front view with a plain white or off-white background. The photograph should be taken in normal street attire, without a hat or headgear that obscures the hair or hairline. Uniforms should not be worn in the photograph with the exception of religious attire which is worn daily. Dark glasses or nonprescription glasses with tinted lenses are not acceptable unless required for medical reasons. A medical certificate may be required to support the wearing of such glasses in the photograph. What if my passport expired? Can I apply for a visa to Vietnam? If your passport is expired, you cannot apply for your Vietnam visa. In this case, please renew your passport before applying for visa to Vietnam. So, before applying for a visa, you need to check your passport to make sure it is valid at least 6 months since your date of arrival in Vietnam. I am a Vietnamese, currently living overseas with a foreign nationality, how can I get a Vietnam visa? Apply for a visa exemption by visiting Vietnam Embassy/Consulate. Further information about Vietnam visa exemption for Vietnamese overseas, please read this link http://mienthithucvk.mofa.gov.vn/. If you would like to save time, you could apply for Vietnam visa online with Vietnam-visa.com. Fill in the below form to submit it to our support center. Answers will be provided within 24 hours!